This rat and mouse bait is effective at treating large home infestations. These large blocks are great for long term treatment of massive home infestations--indoors and outdoors. This gel is perfect when use in conjunction with the standard mechanical mouse trap. Can be used as a substitute for peanut butter or cheese. Mice are you are bound to deal with at some point in your life so do not worry. There are so many simple ways to get the mice out of your home and out of your life. Since you’re reading this article, you are probably curious about the best baits to lure them in. In this mouse bait review, we are going to cover the top 3 best mouse baits in 2019 and the best strategies for using the bait to get the mice out of your home fast. Why Do You Have Mice? This ten-pound pail of rat and mouse bait is effective at treating your entire home for Norway rats, roof rats, and house mice. This large container comes with enough pellets to manage your home multiple times and to even rid you of a massive infestation of mice and rats. You can also use the pellets outside around the perimeter of the home at access points for outdoor field mice. 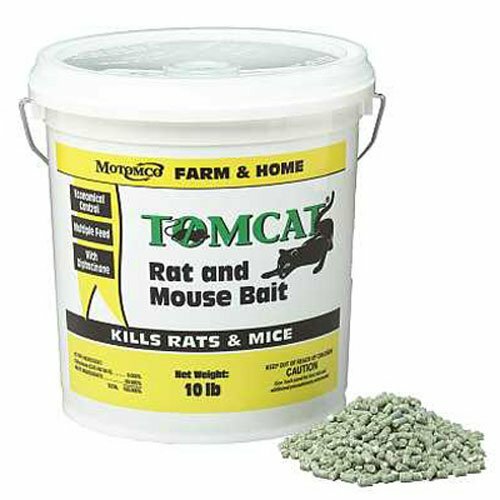 In comparison to trapping the mice, the MOTOMCO Rat and Mouse Bait is an effective treatment because when the pests eat the pellets, they become poisoned and often will go back outside to search for a drink. They eventually die outside your home which does not require any messy cleanup which a typical mouse trap would cause. These pellets can be used in any weather, indoors and outdoors to rid you of pesky mice and rats. The containers come in multiple sizes ranging from one sizeable 10-pound container to four large 10-pound cartons. This product gets produced in the USA. 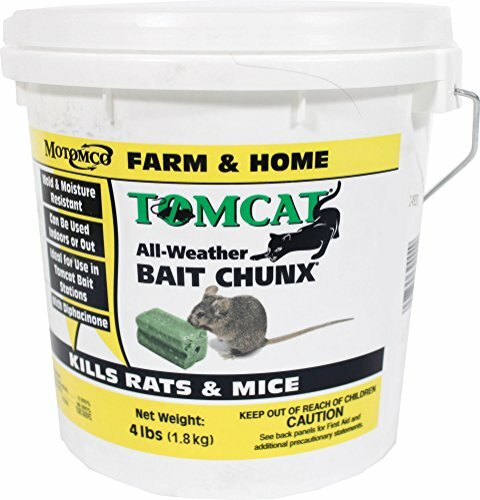 This rat and mice bait is effective at killing a variety of different types of rodents. The bait comes in a four-pound pail and can get used indoors or outdoors. This bait contains food grade materials which makes it extra desirable to the rodents. This bait does not come in small pellets that get eaten whole–this bait comes in large blocks which get picked apart by the mice and rats. This is effective because they often will eat the bait then go outside to find water to drink and die outdoors, so you do not have to deal with any cleanup. Be sure to be very careful when using this bait if you have pets or livestock because they can become poisoned by it if they ingest it. It is not safe for pets or small children. One of the greatest things about this bait is its impact on the rodents. They are attracted to the ingredients in this bait, so it works quickly to get them to come to it and eat it. Within days you should have taken out a significant portion of your infestation if not eliminated it all together. 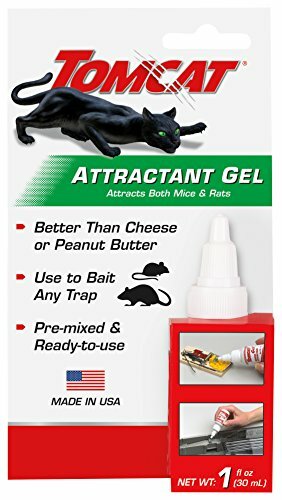 The Tomcat Attractant Gel is intended to get used in conjunction with mouse traps as a substitute for cheese or peanut butter. The gel comes in an easy to use a bottle, so you add a few drops to the trap, and it helps draw in the rodents. The mixture is ready to be used upon opening from the container and attracts both mice and rats. The bottle is simple and easy to use and isn’t messy to apply. The attractant gel is also relatively safe to get used around pets. It does not attract them, but it could be harmful if they ingest it. If you are trying to bait the mice to eliminate the problem you also need to find out why they are coming in, to begin with. You realize you have a mice problem, but one of the best ways to get rid of mice for good is to solve the problem at the source. There are a few different issues that cause mice to become attracted to your home–there are also issues that allow them to get in easily. Mice are not coming into your home because they are curious what you have inside, something is attracting them, and they are deciding if your home is going to be a good place to breed or not. If they can find a consistent source of food in the house, they will make their home in the walls, ceilings, or attic. Do you have pet food that sits out all day? Do you keep bird feeders outside the home? Do you keep trash bags anywhere inside the home, even the basement? Have you cleaned behind appliances regularly? These are some questions you can ask yourself to try and eliminate the mice problem at the core. If you can tackle these issues, then once you bait the mice and kill off the population inside your home–you won’t have to deal with a repopulation. If you have exhausted all those options and it seems like nothing is working, maybe you are making it too easy for mice to get in. If you have an abundance of structural issues with your home like large openings in the foundation, open pipes, openings in the roof, etc.–you could be opening yourself up to a mice infestation even if your house is spotless. Try and close up any obvious access points for mice or rats to access the walls of your home. There are a variety of mouse baits on the market, and each one works best in its situation. It’s important to know which bait will provide the best results for your issues. The most effective type of bait because it works in all types of weather and the effect does not change. These are effective at controlling the population, but you are opening yourself up to serious issues by using pellets because mice like to chew through the containment which allows pets and children to access the pellets. These are large blocks of bait that get picked at by the rodents. These are effective because they last a long time and can control a large infestation without needing to be replaced. When you are placing bait out for the rodents be sure you know what the antidote is if someone ingests the bait. Do not throw away the container until you know the mice consumed all the bait. Only use bait that gets contained in a tamper-resistant container. This does not guarantee the mice will not chew through it, but the manufacturer has taken steps to prevent it. Ensure that the bait is in a secure location that it’s not going to fall out if it gets pushed around by a large mouse or house pet. Most bait stations come with a rod that runs through it to secure it so be sure to use that.